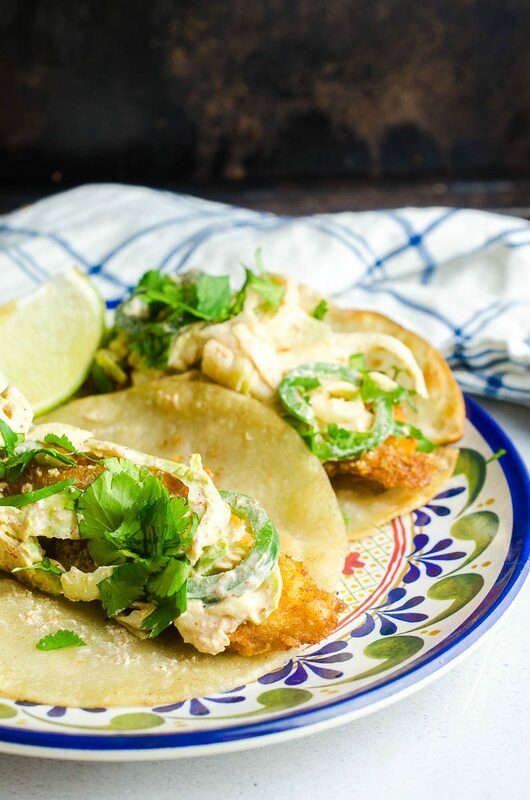 Crispy Fish Tacos are easy to make and always a hit. 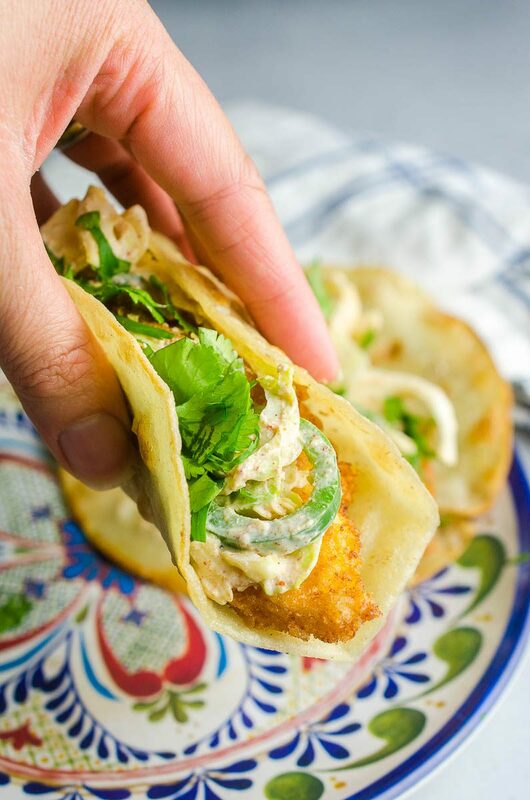 Perfectly crispy panko coated cod and spicy slaw piled into a corn tortilla, the perfect taco for your next Taco Tuesday. I love seafood tacos. 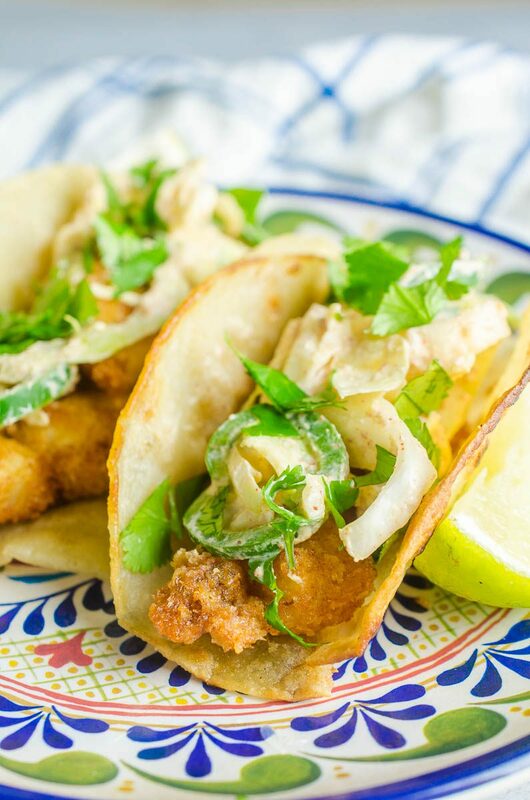 From shrimp tacos to crispy fish. They are all good. I mean what is not to love about fish tacos. The fish is crispy. The slaw is creamy, spicy and tangy. They are pretty easy to make. They go great with a Corona. What kind of fish do you use for fish tacos? To make the best fish tacos, I recommend using a white fish. 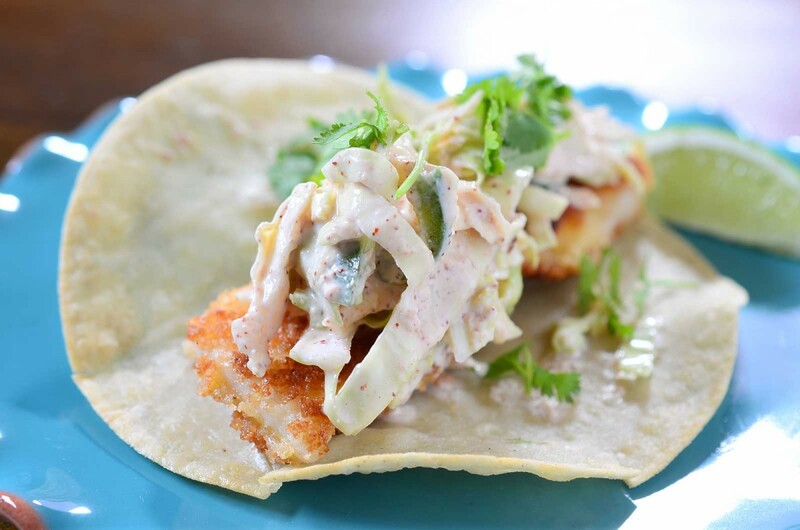 For this easy fish taco recipe, I use cod. We like cod because it’s a mild flavored fish and it’s cost effective too. 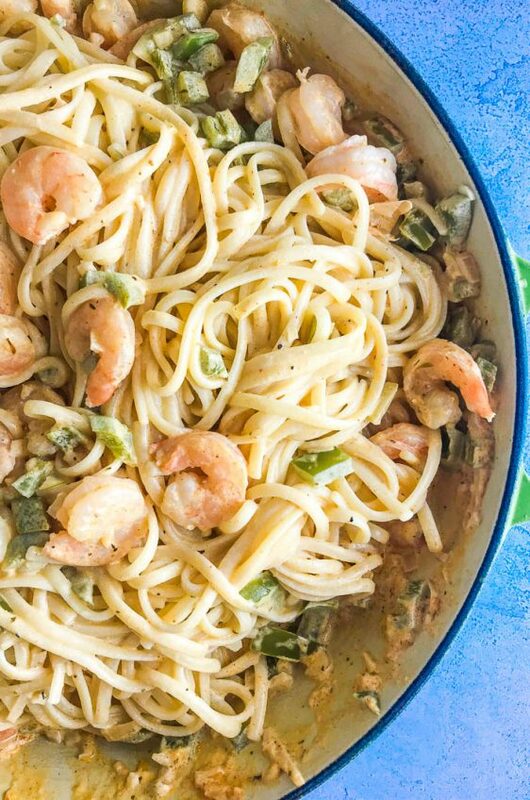 Halibut, snapper or tilapia would also work well in this recipe. Whichever fish you chose, you will want to slice it into strips to make it easier to put into the tacos. To make crispy fried fish, I prefer to use a panko breading instead of a beer batter. 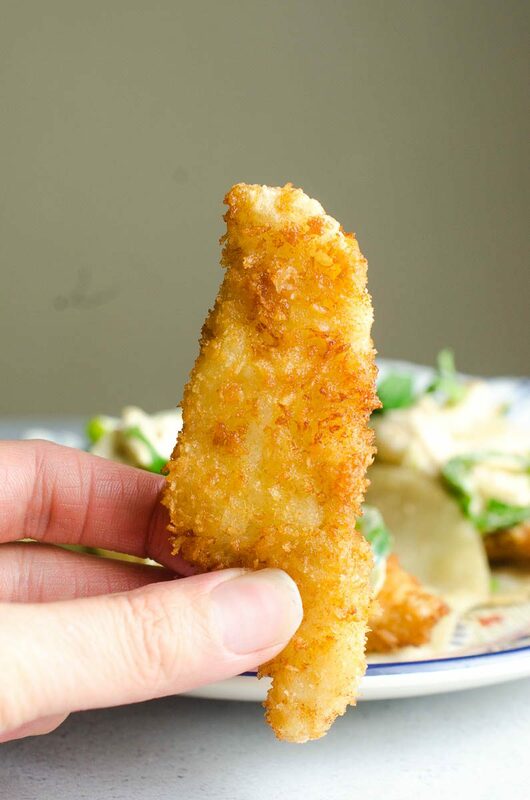 Panko bread crumbs give the right amount of crisp. To make things easy, I set up an assembly line. The first plate has flour, the second egg and the third seasoned panko. First dip the fish pieces in the flour, then the egg and finally the panko. Finally, fry the fish in 350 degree oil for 2 – 3 minute or until they are browned, crispy and cooked through. When frying fish, it is best to cook them in batches so that they don’t overcrowd the pan. Overcrowding the pan will result in more steaming and your fish won’t be as crispy. And believe me. We want crispy. The slaw for these fish tacos could not be easier to make. The bulk of the slaw is thinly sliced cabbage and jalapenos. The coleslaw dressing is where all the flavor is. To make coleslaw dressing simply whisk together greek yogurt, lime juice, vinegar, cumin, chili powder, salt and garlic powder. Finally, mix them all together so that the cabbage is completely coated in the dressing. I like to make the coleslaw at least 30 minutes in advance so that the flavors have a chance to develop. Even better if you give it a couple of hours. Combine yogurt, lime juice, cumin, 1 teaspoon garlic powder, 1/2 teaspoon salt, chili powder and vinegar in a bowl and mix well. Fold in cabbage and jalapeno. Cover and refrigerate for at least 30 minutes. Set up an assembly line with the flour on one plate, the egg on another and panko bread crumbs combined with remaining 1/2 teaspoon salt and 1/4 teaspoon garlic on another plate. Slice cod into 16 pieces (2 pieces of fish per taco). Dip one piece of cod into flour, then egg and finally seasoned panko. Repeat until all cod is coated. Heat a thin layer of oil in a skillet over medium heat. Fry tortillas 30 seconds on each side and fold in half. Transfer to a paper towel lined plate. Repeat until all tortillas are cooked and then cover to keep warm while you are frying the fish. Heat 1/4 inch of oil over skillet over medium-high heat. Sprinkle a few piece of panko bread crumbs into the oil, if it sizzles begin frying the fish. Fry fish, in batches if necessary, until golden and cooked through, about 2 minutes per side. To assemble a taco: place 2 pieces of fish into a taco shell, top with spicy slaw and chopped cilantro. Repeat with remaining ingredients. Serve. These tacos looks so light, refreshing and absolutely delicious! Crispy fish and spicy slaw, i’m sold. I need a plateful of these tacos right away! Yum! Am a HUGE fish taco fan and just planned a taco dinner party! These sound delish and adore you close up shots. Thanks so much for sharing :). Really appreciate your precise instructions for frying crispy fish. The fish tacos look amazingly good and that slaw makes them all the more appealing! 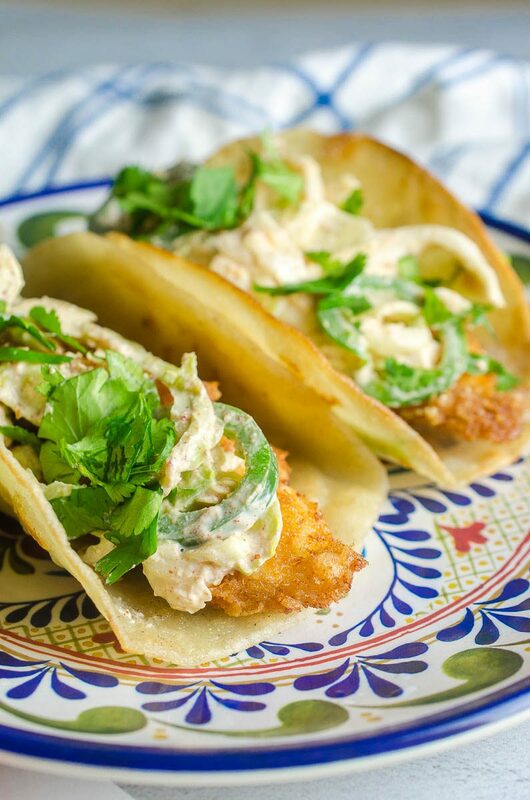 The crispy fish topped with spicy slaw sounds like a great way to celebrate Taco Tuesday. Can’t wait to make this! I think I like fish tacos more than regular beef tacos. They have such a fresh feel and taste to them. Girl you fried those perfectly! Fish tacos are one of my faves, especially the crispy version! I never tried spicy slaw but it looks very delicious and I can’t wait to try it! Mmm fish tacos. Always a goodie! I don’t make them nearly enough! I will have to try your recipe out soon – that slaw looks so good! I could eat fish, all day, every day! I’m loving that you use cod in this recipe as I’m not a huge fan of tilapia. 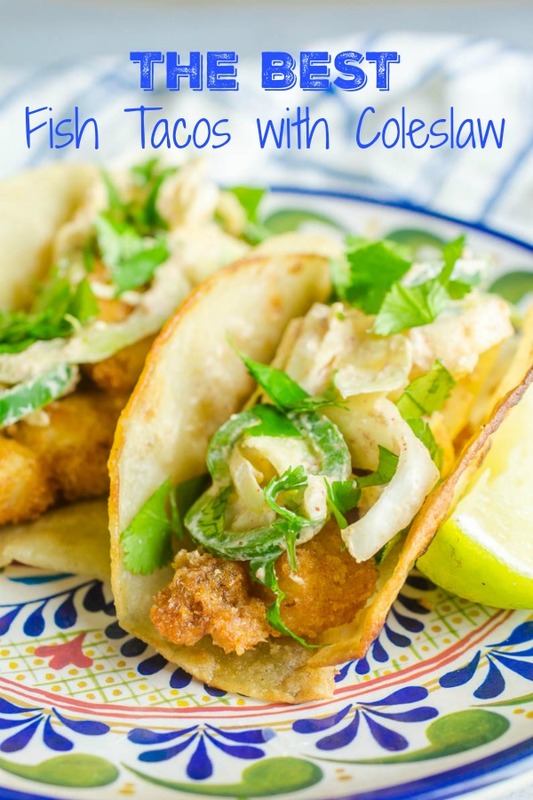 I know that even our boys would love these yummy and flavorful tacos from the sea. Thanks so much for sharing this one! Definitely, need to plan a taco night soon! These look delicious with that spicy slaw and scrip taco shell. Love your photos! Yummy! These look really good! Love how crispy the fish is. It matches perfectly with the slaw and sauce. I agree, cod and halibut are perfect for fish tacos, while we are not big fans of tilapia. I love how crispy these are! They sure to look great! Wow! Great for taco Tuesday! Cannot wait to try it! This is my type of dinner! Now I know what I will make tonight! oh how i love fish tacos. 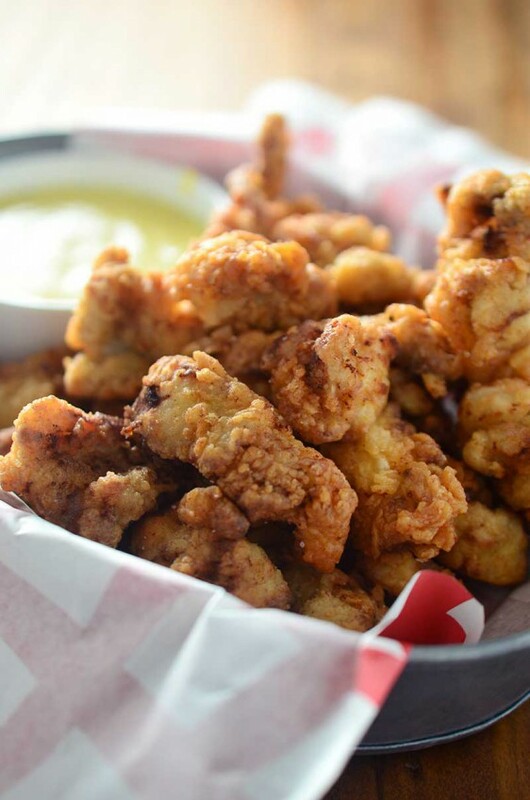 these sound just incredible, especially with that cole slaw. great recipe – I can’t wait to try it! I LOVE fish tacos!! 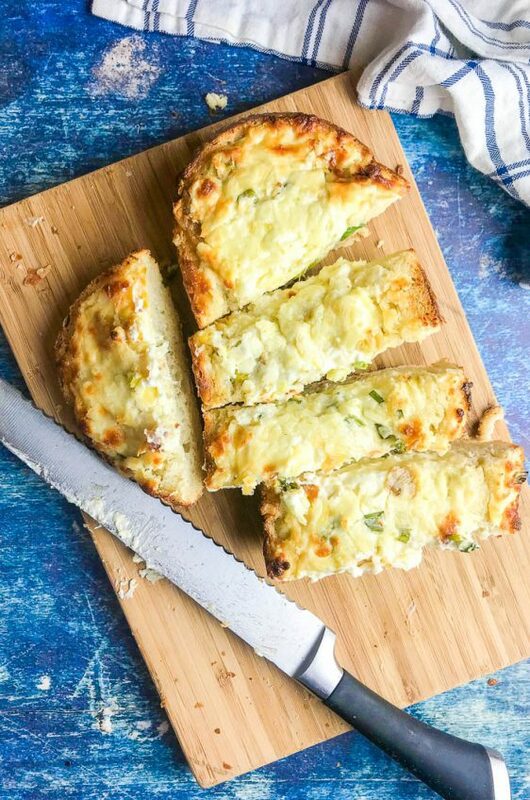 This is such a fantastic recipe!! I can’t wait to try it! I love cod fish tacos! It’s such a delicious fish for that meal. Your cod not only looks delicious but the crisp on it is making my mouth water! I need to try your recipe! Wow the picture is making my mouth water. Spicy slaw was an excellent touch! I love fish tacos; immediately makes me think of a vacation to Mexico! The fish looks perfectly crisp and mouth watering, as well! I just wanted to let you know that I found your recipe while searching for any fish taco with slaw that didn’t think cilantro had to be center stage. I tried yours and haven’t made any other searches for fish tacos. Everyone loves “my” fish tacos, even me, and I don’t really care for fish. So thank you for a delicious recipe, with just the right amount of heat, the perfect crunch, and delicious flavor. Easy and delicious..I doubled the amount of cabbage to dressing. That is so great to hear Regina! Glad you liked it! Made these tonight! So good. The slaw is wonderful. Those fish tacos look so good!